Summer is finally here in Colorado Springs! And all of us at Front Range Electric are excited to finally get to enjoy sunny weather, time spent comfortably outside, and plenty of time together with the entire family. Often summer can be a busy time of vacationing, shuttling the kids from summer camp and back, camping, and other activities. While summer can be a busy time of fun in the sun, it can also, if you have the time, be a season of change. Summertime can be the perfect time for remodeling due to the warmer weather, the accessibility of your home’s exterior, extra free time—if you have any—and the possibility to receive help from the kids. 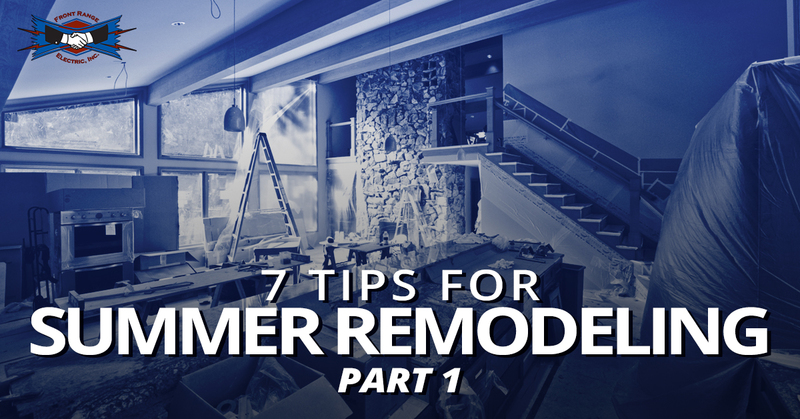 So how do you begin your summer remodeling project? And how do you begin when you have the impatient itch to fix your home and spontaneously grab the sledgehammer? Here are some tips to help you start your summer remodeling project well. Before we get started, we want to take moment to remind you that the electricians of Front Range Electric are here to help in any stage of the remodeling process. Our technicians have the knowledge, experience, and expertise to help you complete your project well. Visit our website to learn more about how we can help! Often when it comes to home improvement projects, it’s easy to find multiple projects and things that you want to change, once you start looking around your home. Simply beginning to think about all the aspects of your home that need to be changed can become incredibly overwhelming. As you begin to think about what you want to change, make a list. This list can either be a physical list that you keep on your fridge or one that you save in your phone that has periodic reminders. Regardless of method, make a list of those changes you would like to make to your home. Next, after you have established your list, begin to prioritize. The deciding factors for how you prioritize will depend on you and your situation. For some, the deciding factor will be to simply look at the budget needed to complete the project and that which is available. Or you may prioritize based on an event that you may be hosting in your home. You may need to prioritize based on the timing of events and your ability to complete the project. Whatever method you choose, pick your project that you are going to focus on first. Once you know what project you are going to focus on first, let yourself dream about what you want. The best way to get an idea of all the possibilities for your remodel is to research online, look at websites such as Pinterest, and home improvement magazines. Though depending on your budget, you may not be able to completely copy those things that you have found that you like, you can at least get an idea as to what you like and what you are actually looking for. Stay tuned for part 2 and of this blog series. As we mentioned earlier the electricians of Front Range Electric are here for the residents of Colorado Springs to help you with your remodeling projects, as well as keep you cool by maintaining your air conditioning. To find out more about us, view available coupons, and schedule a free consultation, visit our website!